The global implantable medical devices market is a highly consolidated arena. The top five companies, namely accounting for Institut Straumann AG, Medtronic Plc., Johnson & Johnson, Zimmer-Biomet, and Stryker Corporation, accounting for a share of over 50% in 2015, reports Transparency Market Research (TMR) in a recent study. The dominance of these players can be attributed to their constant efforts to introduce novel and effective product varieties, strong focus on innovation, and large geographical outreach. “Stringent government regulations and the requirement of sound technical knowledge and robust infrastructure for research and development are creating high entry barriers for new players,” says TMR’s lead analyst. However, the advent of more promising substitutes to conventionally used materials is anticipated to intensify competition in the global implantable medical devices market. 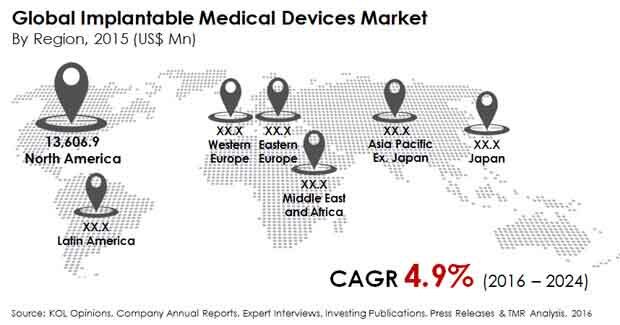 The global implantable medical devices market is expected to exhibit a CAGR of 4.9% from 2016 to 2024, rising to a value of US$49.8 bn by the end of 2024 from US$32.3 bn in 2015. On the basis of material, titanium was the dominant segment in 2015. However, titanium alloys and zirconium are poised to surpass this segment during the forecast period. The markets for titanium alloy implants and zirconium implants are estimated to rise at 5.5% and 6.4% CAGRs during the same period. Geographically, North America represented the leading share of 42.0% in the overall market in 2015. The presence of an advanced healthcare infrastructure and favorable reimbursement policies are supplementing the growth of the region. Owing to these factors, the region will retain its position until 2024. The report also suggests that Asia Pacific excluding Japan will offer lucrative opportunities during the forecast period, owing to the booming medical tourism industry and high unmet medical needs. The rising incidence of dental disorders and chronic degenerative diseases is one of the primary factors augmenting the global implantable medical devices market. “While a shift towards unhealthy dietary habits and sedentary lifestyles and the growing global geriatric population are paving way for the increased prevalence of chronic health diseases, the increasing consumption of fast/junk food is one of the key reasons behind increased occurrence of dental issues,” says a TMR analyst. The growing awareness and consciousness about physical appearance coupled with the changing perspectives regarding cosmetic surgeries are translating into the greater uptake of implantable medical devices. Besides this, the soaring cases of congenital disorders are likely to have a positive impact on the growth of the market. Studies have demonstrated that implants made of chromium and nickel are susceptible to corrosion and can give rise to cancers. Besides this, cobalt alloy is known to pose risks to human health due to in vivo ion release and polyethylene can potentially lead to conditions such as localized tissue ruptures and bone lysis. Due to these health hazards caused by the materials used in the manufacturing of implants, patients are inclining towards substitutes. In addition to this, the constant improvements and developments in the field of surgery are prompting consumers to prefer surgeries that pose minimal risk to health. Moreover, the high costs of medical implants are inhibiting the growth of the global implantable medical devices market.